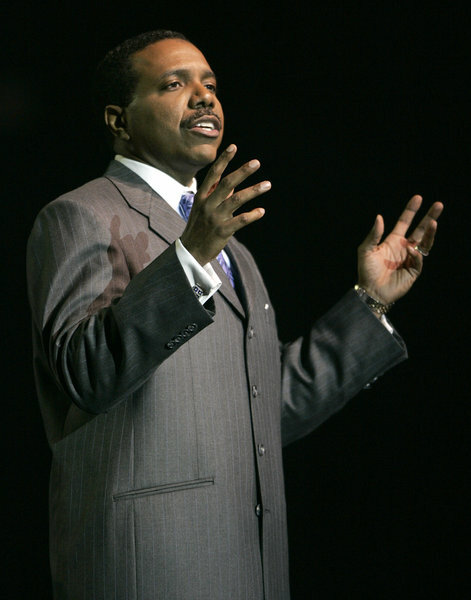 My editorial policy initially informed me to make no mention of millionaire clergyman Creflo Dollar—known from this point in my post forward as reverend Cash-Flo’—since everyone else seemed to do a cool job of ripping him a new orifice after he announced the need for a 65-million dollar jet plane to help support or advance his ministry. I also wonder if reverend Cashflo’ even cares that Jesus Christ was a materially poor African revolutionary who was not only an advocate for the poor, but he was also born in poverty. If Jesus’ parents had any loot, don’t you think they would’ve upgraded those birthing accommodations beyond the smelly-behind stable where Jesus ended up being born? Worse than just a stable, Jesus’ more precise birthplace was a trough—you know, that nasty thing horses and cattle eat from. The Bible calls it a manger. (Laughing) I’m sure reverend Cash-Flo’ interpreted those last two verses to mean people “poor” in spirit, as opposed to broke folks, but Christ was speaking to a group of religious and social elites at that moment. It was the equivalent of laying a deserved bombshell of knowledge on the unsuspecting, except Christ chose not to drop the mic and leave—he sat down and drew stares from the shocked congregation. There’s no inherent crime in being rich, or lifting others out of poverty. I just don’t see reverend Cash-Flo’ doing much of the latter. Forget the suggestions that reverend Cash-Flo’ could fly first class all the time and still spend less than $65 million, or that he could build housing and create jobs as a substitute for his dream jet. Here’s an idea—reverend Cash-Flo’ should invest $65 million in teaching poor communities financial literacy and business skills as a way to permanently move them out of poverty. I would imagine that the Son of God would be down with that kind of ministry. This entry was posted in Society and tagged black theology, creflo dollar, liberation theology, ministry, prosperity, religion. Bookmark the permalink.